This challenge involved using previously discarded Cricut cuts and paper scraps. 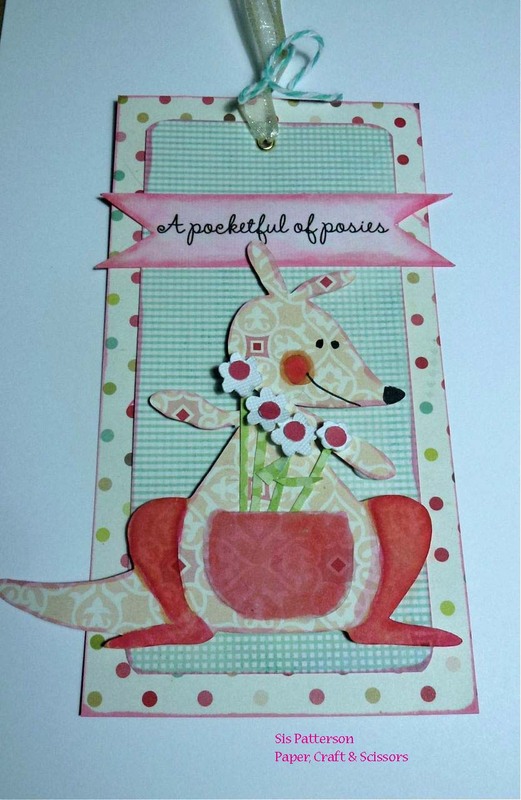 The only cuts I had available were a kangaroo base left over from the kangaroo and baby card and some little white flowers from today’s earlier challenge. I used my Copics to color in the legs and pouch on the kangaroo and drew in her features as well. I hand cut the stems and used my Crop A Dile to punch the flower centers. The sentiment was printed on my computer, hand trimmed, and colored. Taking photos after losing natural light proved to be a greater challenge than using scraps or the 2 hour time limit. The colors really are not as stark as they appear! This is sooooo cute! OK – I am impressed that you could make the tag, post it, and have time to comment on others before the time limit. I am speechless! Oh My! That is just adorable! I love what you did with your scraps! Cute! Luv the color combo’s you used to make this tag. This is so adorable. And you made it with scraps in under two hours. I am in totally impressed…as if I weren’t before. She is too cute with her pocket full of posies. Love the happy colors and papers. I have to catch up on those blog posts so I can see what you all have been up to for the past couple of days! Too cute, Sis!